The “Mighty Eagle,” a NASA robotic prototype lander, is soaring high again for a series of tests being conducted at NASA’s Marshall Space Flight Center in Huntsville, Ala. Since its last round of tests in 2011, the Mighty Eagle team has made significant updates to the guidance controls on the lander’s camera, furthering its autonomous capabilities. The three-legged “green” lander is fueled by 90 percent pure hydrogen peroxide and receives its commands from an onboard computer that activates its onboard thrusters to carry it to a controlled landing using a pre-programmed flight profile. It is 4 feet tall and 8 feet in diameter and, when fueled, weighs 700 pounds. 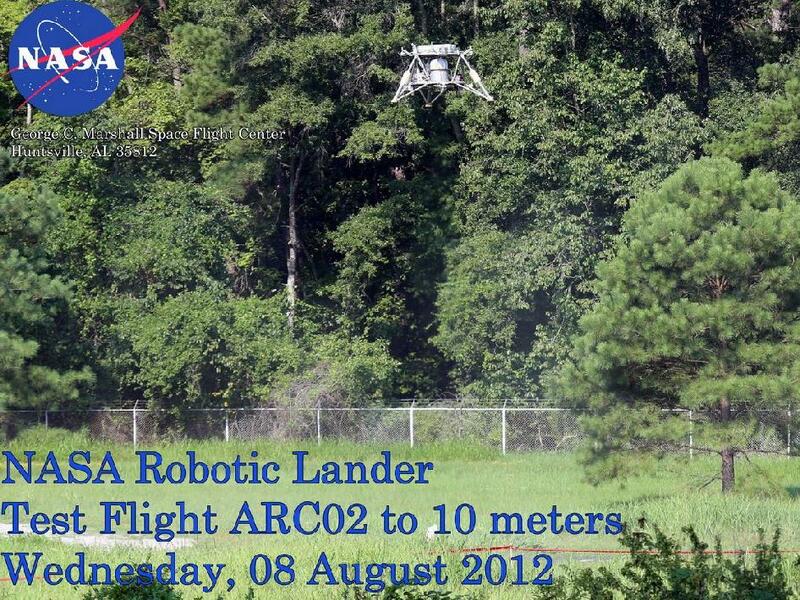 In this series of tests, which will continue through September, the lander prototype will autonomously fly and hover at 30 feet for two tests, and up to 100 feet for another two tests, and then move sideways, to safely land 30 feet away from the launch pad. The test demonstrates what it will take to perform the final descent of an autonomous controlled landing on the moon, asteroids or other airless bodies. “These lander tests provide the data necessary to expand our capabilities to go to other destinations,” said Dr. Greg Chavers, engineering manager and warm gas test article lead at the Marshall Center. “It also furthers our knowledge of the engineering components needed for future human and robotic missions.” NASA will use the Mighty Eagle to mature the technology needed to develop a new generation of small, smart, versatile robotic landers capable of achieving scientific and exploration goals throughout the solar system. The Mighty Eagle prototype lander was developed by the Marshall Center and Johns Hopkins University Applied Physics Laboratory in Laurel, Md., for NASA’s Planetary Sciences Division, Headquarters Science Mission Directorate. Key partners in this project include the Von Braun Center for Science and Innovation, which includes the Science Applications International Corporation, Dynetics Corp. and Teledyne Brown Engineering Inc., all of Huntsville.